I love creating recipes that you can have for breakfast, lunch or dinner. Things like my sweet potato and kale rosti or cod and sweet potato fish cakes. They are diverse enough to have on their own, or simple enough that you can add something extra with them for a lunch of supper. This baked sun-dried tomato stuffed Portobello mushrooms recipe is simple, comforting and delicious. It can be enjoyed as a main meal or as part of a meal. 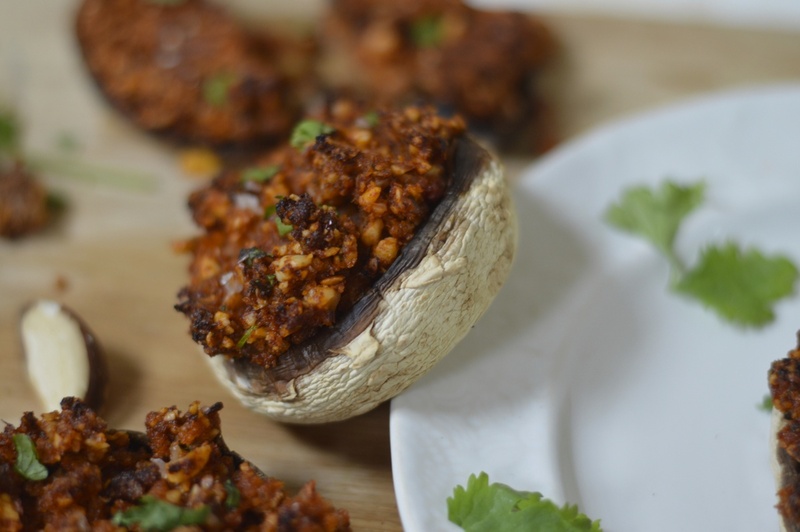 You could even use smaller mushrooms and stuff them for an starter / appetizer. Although mushrooms fall under the “vegetables” category on most food forums, they are not technically plants. They belong to the fungi kingdom and although they are not vegetables, mushrooms provide several important nutrients. Mushrooms are deliciously low carb (perfect for Diabetics) and packed with vitamins, nutrients, antioxidants and fibre. I am a huge fan of mushrooms, especially stuffed or cooked in some coconut oil with some sea salt, herbs and spices. This recipe is packed with flavour and nutrition and really does tick every box. For people looking for something low carb that’s free from dairy, gluten, grains and friendly on the blood sugar then I urge you try this. If you need to be nut-free then you can substitute the nuts for seeds, I would suggest using a mix of sunflower and pumpkin. I use organic sun-dried tomatoes in olive oil- like these here However if you already had fully dried ones then I would suggest soaking them in olive oil for at least 2 hrs prior to cooking to rehydrate them. Alternatively you could soak them in boiling water, this would make the whole process a lot quicker. 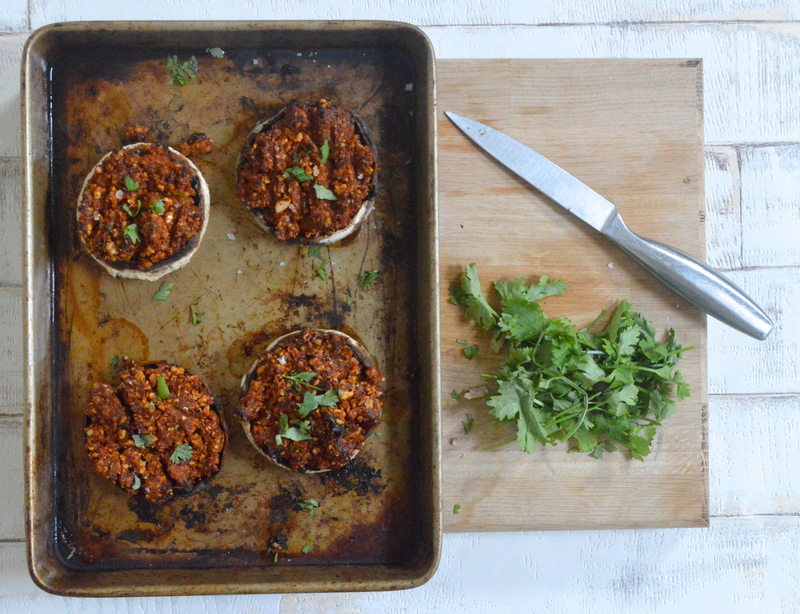 Sun-Dried Tomato and Almond Stuffed Portobello Mushrooms A delicious, simple and nutrition packed dish that can be enjoyed for breakfast, lunch or dinner. It's Vegan friendly and 100% Paleo too (free from dairy, grains, gluten, refined sugar and soya). Fussy Paleo ingredients and what is coconut sugar? This looks super yummy, can’t wait to try it. Quick question about the sun-dried tomatoes. Do you use the ones packed in oil or do you use the fully dried ones that need hydrating? If it is the fully dried ones, do you hydrate them before blending? Also if I just wanted to stuff normal chestnut mushrooms, would I shorten the cooking time? Just thought I’d give you an update. I used chestnut mushrooms but did have to swap the almonds for cashews and basil for coriander as that was all I had, but oh my gosh, these were unbelievable. Thank you so much for a great recipe. I will be making these often!